Bodhidharma is revered as the father of Ch'an and Zen Buddhism. Most of us involved in Ch'an, Zen or Buddhism know that the word Ch'an is a rendition of the Pali word Jhana, which means meditation. Similarly, we know that the Japanese word Zen is a rendition of the Chinese word Ch'an. Buddhists and Orientologists are aware that the Ch'an/Zen texts hold that an Indian Monk named Bodhidharma is attributed to be the founder of Ch'an and therefore Zen. There have been various theories presented on Bodhidharma by the academicians or Orientologists who study the Ch'an/Zen branch of Buddhism. However, these are arbitrary. After years of studying Ch'an/Zen, the authors of this excerpt are presenting a different and radical perspective. This work does not place emphasis on merely the historicity of Bodhidharma [Ta Mo in Chinese and Daruma Daishi in Japanese]. Instead this work emphasizes on the metaphysical sense of the said propounder of Ch'an or Zen Buddhism. If one travels to Asia, that is, China or Japan, one might notice that the Ch'an or Zen Masters of the ancient past, and especially Bodhidharma, are revered as Divinities. This is because within the apparently simplistic texts of the Ch'an or Zen there is an Esoteric aspect that preserves for posterity the metaphysics of Ch'an or Zen. However, the contemporary world of Buddhist scholars did not realize this and could not understand why the Ch'an/Zen followers approached Bodhidharma as a Buddha or Divinity. In accordance with this Esotericism was the culture and practice of Ch'an/Zen. However, in the wake of contemporary culturing even the Chinese, Japanese and Koreans adopted the so-called rational approach to the practice of Ch'an/Zen and therefore abandoned their traditional approach. In the wake of this attitude the Kung-an/Koan's of Ch'an/Zen are interpreted as verses that one cannot not grasp intellectually. However, this view is based on an error in reading the texts. To understand this, let us scrutinize an early Chinese text on the propounder of Ch'an and therefore Zen. This will lead us to understand that innately in these texts are esoteric notions of Ch'an/Zen Buddhism and they offer reasons as to why the non-Westernized cultures have a variant approach to Bodhidharma to the West. The earliest narrative on Bodhidharma, though apparently brief, is presented in a Chinese work that is offering a description of the forty-five temple monasteries of Lo-Yang. Apparently a Chinese monk known as Yang Hsuan-chih is presented meeting Bodhidharma who originated from the Western Region, who was a hundred and fifty years of age, in the temple of Yung-ning-ssu [Japanese, Einei-ji]. This narrative of the Yung-ning-ssu, as part of the Lo-Yang temple narrative, is in fact a remarkable record on the reconciliation of philosophies by the Chinese tradition. In fact, the Chinese tradition not only reconciled the differences between the ancient Chinese philosophy of Taoism and the later philosophies of Buddhism as the Sarvastivada and Mahayana, but also offered a solution to explain the differences between these philosophies. Unfortunately, due to the lack of understanding of the language of the ancient, religious philosophies, the Lo-Yang or Yung-ning-ssu narrative could never be appreciated by the contemporary world of scholars and also Buddhists. Though the Lo-Yang or Yung-ning-ssu narrative is a remarkable record on Chinese philosophy, we will instead focus on the philosophy and history of Ch'an or Zen Buddhism that is centered around Bodhidharma. 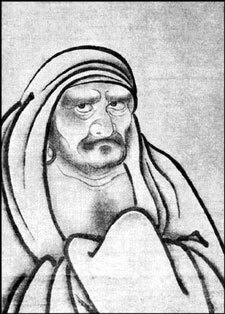 The name Bodhidharma is composed of two Sanskrit words. The word Bodhi refers to the Ch'an/Zen Buddhists' definition of the Ultimate Reality as this Mind-All Reality, which is to them the Buddha Nature. Dharma is a Sanskrit word that equates with Tao. However when both words are read together, Bodhidharma would mean the Propensity of the Mind or Bodhi Essence. In simple words, the Ch'an/Zen records also carry within their narratives a metaphysical sense or meaning of Buddhism. In this sense, Bodhidharma can be read as denoting the Ch'an or Zen Ontology. In fact, the modern world of scholarship is unaware that Ch'an/Zen is not devoid of philosophy and metaphysics but that its praxis does not dwell on it. To understand this, let us interpret a portion of the Lo-Yang or Yung-ning-ssu excerpt that is relevant to Bodhidharma or Ta Mo [Chinese] and Daruma Daishi [Japanese]. "In those days there was a Shramana Bodhidharma from the Western Regions, originally a man from Persia [?]. He came from rugged countries and was staying in the Middle Land. When he beheld how the golden dome sparkled in the sun, how its light reflected upon the surfaces of the clouds, how the precious bell housed the wind within itself and how its voice rang beyond the heavens, he sang a hymn of praise, 'Truly how wonderful it all is!' He said that he was one hundred and fifty years old and had traveled all countries and visited all regions, but that nothing in Jambudvipa was comparable with the beauty of this temple, that it surprassed all others, and that there was nothing like it anywhere. With hands clasped, he daily invoked devotedly the name of Buddha." ["Zen Buddhism: A history of India and China" by Heinrich Dumoulin]. where will it find an end?" ln fact, before Ch'an or Zen, the belief was that the Cosmic Breath "gave the initial stir" within the Cosmic Absolute, after the occurrence of Primordial thought or Logos, to propel Genesis. However, the Ch'an or Zen tradition, which believes in the Bodhi or Buddha Nature as an immanent reality, maintains that the Primordial Prana or Cosmic Breath or Wind does not emanate. The Emanation that we believe occurs is merely an experience of our conditioned, Karmic minds. Thus all there ever was and will be is the Bodhi or Buddha Nature. This Bodhi or Buddha Nature is Esoterically termed as Bodhidharma by these metaphysical records of Ch'an/Zen. Thus, the text says that Bodhidharma beheld "how the precious bell housed the wind within itself and how its voice rang beyond the heavens." The phrase, "its voice rang beyond the heavens" means that this Cosmic Sound that triggers Creation [according to all schools of religio-philosophy] occurs in the Void or Sunya [in Buddhism and Ch'an/Zen]. In other words, since the Bodhi or Buddha Nature is an immanent reality, this "ringing" or Manifestation does not unfurl but occurs. This takes Ch'an or Zen to the understanding that the Bodhi or Buddha Nature is immanent. In simple words, we in a sense do not at all manifest but in actuality exist in the Bodhi or Buddha realm, only our Karmic conditioning makes us believe that we are in a manifested, mundane world. Then the text states that Bodhidharma "had traveled all countries and visited all regions, but that nothing in Jambudvipa was comparable with the beauty of this temple, that it surpassed all others, and that there was nothing like it anywhere." This statement means that the text is aware of "all countries" or philosophical premises and "all regions" or all the three realms or realities of the Mahayana Buddhists, that is, Dharma-kaya, Samhhoga-kaya, and Nirmana-kaya. However, nothing in Jambudvipa was comparable with the beauty of this Temple or Ontological Reality. In other words, the Ch'an or Zen philosophy believes that the Bodhi or Buddha Nature is immanent and this far surpasses in "sublimity" even the philosophical premises of the Transcendentalists. It also surpasses the philosophy of the Realists and Idealists that is jargonically referred to in the text as Jambudvipa or, hyper-jargonically, India. It is this Immanent Bodhi Reality that Bodhidharma saw in this temple and since he is in fact one with the temple, "With hands clasped, he daily invoked devotedly the name of Buddha." Thus, the above Lo-Yang or Yung-ning-ssu narrative had all along contained the entire seeds of Ch'an/Zen philosophy, which was beyond the understanding of the contemporary world of Buddhologists. Since Buddhologists contend that the Lo-Yang or Yung-ning-ssu [Japanese, Einei-ji] record is at least as early as the 547 AD era, the history and also the philosophy of Ch'an/Zen has to be rewritten. By pointing directly to Mind. It lets one see into nature and attain Buddhahood." Indeed, it is a special transmission outside the scriptures [Taoism, Vedism, Sarvastivada, and Mahayana]. Of course since the Ch'an or Zen tradition believes in an Immanent Bodhi or Buddha Reality and therefore not an externalized manifestation or materialisation of the Cosmic principle of Sound, the tribute,"Not founded upon words and letters" is apt. Since the Bodhi or Buddha Reality is immanent, one only needs to point directly to this Bodhi or Buddha Mind or, simply, Mind and it leads one into its nature to attain Buddhahood. Though sometimes Buddhologists talked of the profundity of this four-line stanza on Ch'an or Zen, its real profundity was not noticed. Thus, both D. T. Suzuki and Heinrich Dumoulin could not understand these records of Ch'an/Zen. "Bodhidharma, of South Indian Brahmin stock, was a person of wonderful wisdom and penetrating clarity who understood everything he heard. Since his purpose was fixed upon the teaching of Mahayana, he quieted his mind in deep concentration. He understood small things as well as things of great moment. He deepened Samadhi. He pitied this remote corner and guided with the help of the Dharma." This Tao-Hsuan narrative enumerates that Bodhidharma was of "South Indian Brahmin stock." The term South Indian suggests that this text can be read from the perspective of the Transcendentalists [Chinese, SAN LUN; Japanese, SAN RON]. According to the Transcendentalists, the Bodhi or Buddha Nature exists in the West as it survives the Solar Dissolution. However, the Transcendentalists contend that the Bodhi or Buddha Nature, being Absolute, is a principle above the Solar reality. Thus to the Transcendentalists [SAN LUN or SAN RON sect], the Buddha Nature is a principle that survives the Ultimate Dissolution which occurs in the South. Thus, the term Jambudvipa, or its hyper-jargonic equivalent India, denotes the philosophical premises of the Transcendentalists [as this Chinese text reads]. The term "Brahmin" of course refers to the unadulterated meaning of the word that means an intellectual, thus suggesting the unfolding of the Intellect or Cosmic Mind within the human being [according to the view of the Realists or Transcendentalists, vide "Divine Initiation"]. It is this that is meant when the Tao-Hsuan narrative says that Bodhidharma was of South Indian Brahmin stock and not him as a wandering Indian person who originated from South India as contemporary Buddhists and Buddhologists assume. In fact, Bodhidharma is this Cosmic Intellect or the Bodhi or Buddha Essence that is either Transcendental to the Transcendentalists [Chinese, SAN LUN; Japanese, SAN RON] or immanent to the lmmanentists [Chinese, Ch'an; Japanese, Zen]. Thus He, or the Metaphysical Entity Bodhidharma, is said to possess Omniscience or "Amazing Wisdom" and Intellect or "Penetrating Clarity" and understand everything He, or the Metaphysical Entity, "heard." Of course the term "heard" emphasizes that this Bodhi Absolute Reality thinks and thus hears. This is within the notion of a Transcendental Absolute Conscious Reality that utters the primordial Word that causes Genesis. However, in the Lo-Yang or Yung-ning-ssu narrative, the word Shramana is used. The Sanskrit word Shramana means "to exert." In fact, the Ch'an or Zen reading of this text asserts on an Immanent Absolute Bodhi Reality that does not like the Transcendental Absolute Reality speak or utter or manifest a Cosmos. This emphasizes that this Immanent Absolute Bodhi Essence is Omnificent. It is to highlight this that the word Shramana is used in the Lo-Yang or Yung-ning-ssu text. Thus, Bodhidharma quieted his mind in deep concentration or "deepened Samadhi." In other words, this Absolute Bodhi Reality facilitated us with the path of Dhyana. Thus "He pitied this remote corner" or this "Worldly reality" or infused it with the philosophical validity of an Immanent Absolute Bodhi Reality with the help of Dharma or his propensity, or as a compassionate Bodhidharma of the Transcendentalists he offered Salvation to this world. The Chinese texts, as explained above, permit a two-way reading. Thus, Bodhidharma or this Bodhi Essence "understood small things" as the Bodhi Essence is immanent, and also as this Bodhi is Absolute, it understood "things of great moment" or the Transcendentalist philosophy [Chinese, SAN LUN; Japanese, SAN RON] that asserts on Sequentiality or Time as the cause of Genesis. "Bodhidharma was a teacher of the Dharma who came from South India in the Westem Regions, and was the third son of a Brahmin king; possessed of amazing wisdom and penetrating clarity and thoroughly understood everything he heard." In fact, the main corpus of this text is the same as the Tao-Hsuan narrative. However, the variations like the above phrase that Bodhidharma was the third son of a Brahmin king offer further information. As explained in the topic on Asanga [vide "Third Eye of the Buddhist"], the term king denotes the notion of materiality or the phenomenological reality. Thus a Brahmin king in fact only denotes that the Mind is essentially of this world realm. This phrase merely highlights the Mind Nature within this world, to better illustrate the Immanent nature of the Bodhi Essence or Buddha Nature. [However, like all Chinese texts this text also allows for a Transcendentalist interpretation.] Thus, there is not any caste or parentage of an Indian person in these texts. In fact, the narrative of the "Lanka Avatara Masters" also has another verse that is variant. This is the statement that, "Finally, He [Bodhidharma] crossed far over mountain and sea in order to preach in Wei or China." This too can be interpreted from both Transcendentalism and Immanentism. The Transcendentalist reading is that this Bodhi Essence or Bodhidharma metamorphosed to become the Manifestation [or Mountain] and Consciousness [or Sea] to manifest this world [vide "Divine Initiation" and "Third Eye of the Buddhist"]. The phrase "in order to preach in Wei or China" denotes that this is a particular interpretation of Transcendentalism of the Chinese [Chinese, SAN LUN; Japanese, SAN RON]. The sentence, "Finally, He crossed far over mountain and sea in order to preach in Wei or China" also can be understood as the Bodhi Essence or Bodhidharma surpassed the notion of Manifestation [Mountain] and Absolute as Chaos or Consciousness [Sea] to offer an Immanentist science within Wei or China. This is the Ch'an or Zen interpretation of this verse. Transcendentalism and Immanentism in China and Japan. The reason for the Chinese philosophical tradition to term this notion of an Absolute Bodhi Reality with a Sanskrit term is not to politically, economically, or socially placate the Indians, but to impart that this metaphysical Entity as denoted by Bodhidharma is within the folds of Indian Buddhist metaphysics too. In other words, the Chinese are saying that the notion of an Absolute Bodhi Essence is but a doctrine that is shared with the Indian Buddhist traditions. It is due to this reason that the Ch'an and Zen Buddhists in Asia worship the metaphysical Entity known as Bodhidharma or Ta Mo [Chinese] and Daruma Daishi [Japanese]. This explains the distinction in approach towards the culture and practice of Ch'an/Zen during the last two millennia as to the original world of Ch'an/Zen in China, Japan and Korea. © 2001 Bhagavan Shri Shanmukha Anantha Natha and Shri Ma Kristina Baird from "Third Eye of the Buddhist".